Let’s keep everyone safe this Halloween! Read our great lighting tips to help Ohio trick or treaters see and be seen this Halloween! Great Halloween safety tips for homeowners! 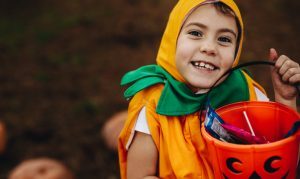 Halloween is a day of fun for kids and families; but because the festivities often carry on after sunset and well into the dark, safety can become an issue. By making a few smart lighting choices for your home and family, you can help make Halloween safe and fun! Whether you’re lighting your home in Cincinnati or Cleveland, follow our best electricity-saving lighting tips to make the most out of this sweet holiday. Our best lighting ideas for Halloween Safety. Stick with dim or soft lights: our eyes actually take hours to adjust to darkness, so going from brightly lit porches back out into the darkness can be hazardous. To make this adjustment easier for trick-or-treaters, light your porch with soft or dim lights. Light up your walkway: your porch may be well-lit, but can kids easily and safely find their way to it? Use fun and festive luminaries to light the path you want people to walk to your front door. Switch out candles for LED flameless lights: candles look great, but when left unattended outside your home they can be dangerous. Go with electric flameless lights for luminaries, pumpkins, and anything outdoors to reduce the risk of fire. Plus, they’re cheap and available in bags of 10 or more from any big-box store. Go with a green energy option and light up with LEDs! Highlight hazards: use glow in the dark paint or chalk to draw attention to cracks or steps that people may trip over in the dark. Make sure not to go overboard and start decorating with glow paint or your warnings might blend in and be overlooked. Make the kids more visible: get light-up candy bags or buckets, affix reflective tape to costumes, and deck them out with flashing lights or glow sticks. Keeping kids more visible as the night goes on will keep them safer. Bring a flashlight: the trusted tool is a must for Halloween and trick or treating. If you’re accompanying the kids, be sure to carry at least one with you. If the kids are going out on their own, send one with them on a string they can easily keep on their wrists or around their neck. You can still save money even when you’re using more lighting! Now that you have the Halloween safety tips down, you’re ready to enjoy all the tricks and treats the night may have to offer. After spending a little extra money on Halloween goodies and safety items, you can earn it back when you lower your electric bill. When you shop our site, you can easily compare electric rates apples-to-apples and find a cheap electric plan that will save you money. Compare Ohio electric rates today! Start saving at https://www.ohenergyratings.com/electricity-rates.